this route is now usually reached from the Macaulay Valley. Sibbald has three peaks. A climb of the northern summit is straightforward and gives good views. 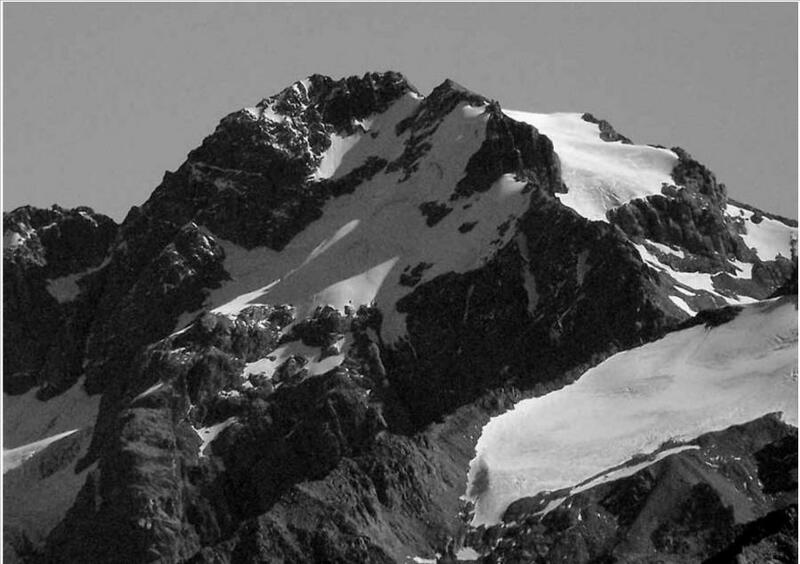 Although outside the AMCNP boundary, Mt Sibbald is a prominent peak and a popular climb. The usual approach is from the Macaulay Valley. Macaulay Hut, described at the beginning of the Godley Valley section, provides a good base. However, a high bivvy could be useful. This route climbs a 300m couloir through centre of West Face buttress. It has one mixed step to begin with (M3), continues as a snow gully with some more mixed terrain on exit. It tops out closer to South rather than North summit of Mt. Sibbald. Some route finding required to exit Lucifer stream. Descended West Face. From the upper reaches of the Macaulay Valley follow the Upper Tindill Stream to gain the saddle north of the peak. Then follow steep glacier slopes south to the north summit - the traverse from the north to the main peak (south) is mostly rock now and has one or two difficult spots. Ski option: Ski from the South Summit all the way to the Macaulay Valley floor. From McKinnon Stream in the Godley, then onto the North Ridge. A variation: use McKinnon Stream and then scree slopes directly to the North Ridge. Neville Johnson, H J Newberry, Ian Powell, Dec 1934. Variation first climbed by Ross Cullen, Peter Fowler, Pip Lynch, Jeremy McMahon, Dec 1981. From Lucifer Flat in the Godley. First climbed as part of a traverse, from the north branch of the Macaulay, using the south-west ridge as a descent. This route was descended as part of a South West Ridge – South East Ridge traverse and can be accessed from the Upper Tindill Stream catchment. From McKinnon strean make way up steep scree to low point west of pt 1991. Traverse ridge, defaulting to the northern side when required. The scambling gets more interesting at pt 2516. After the last of the difficulties are past here, you can travel on snowfields at join the origional normal to the summit.